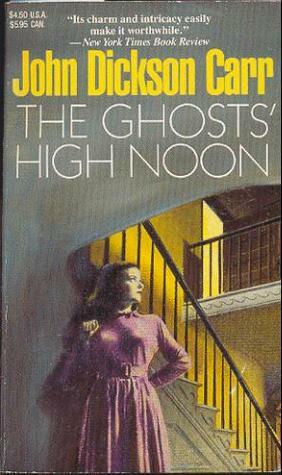 Then is the spectres' holiday – then is the ghosts' high-noon! 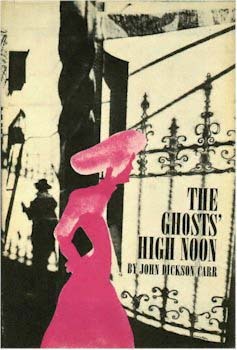 The best part about John Dickson Carr’s The Ghosts’ High Noon is probably the title. Those words are absolutely brilliant, conjuring up ghostly images appearing in dark shadows, with a full moon in the sky… Unfortunately, the rest of the novel falls short of this brilliance. Which isn’t to say the novel is bad; in fact, it’s rather good stuff. It’s a good effort overall by Carr, but it fails to cash in on the promise of ghostliness the title makes. The novel takes place in 1912 New Orleans, and Jim Blake is its hero. He is a reporter-turned-author, who wrote a best-selling thriller, The Count of Monte Carlo. He is sent on a special assignment to New Orleans, to come up with an article on Congressional candidate James Clairborne (Clay) Blake. Strange things begin to happen, as Jim is convinced someone is following him in Washington. On the train, someone knocks at a compartment he is occupying, but when he opens the door, nobody is there, and two railway officials on opposite sides of the hallway are willing to swear nobody went by them! 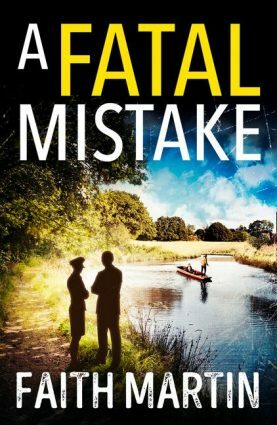 Things culminate when Jim’s friend Leo Shepley recklessly drives his car into an abandoned shed: a gunshot rings out inside, and when witnesses rush to the shed, Leo is lying on the floor, a gunshot wound in his head… with no gun anywhere in sight! Yes, it’s another impossible crime novel spun by the master! Unfortunately, the impossible situation on board the train is a major disappointment: one of the worst tricks in the game and one I’m surprised Carr stooped to using (considering a far better train disappearance is worked in Castle Skull). The second impossible situation, the murder in the shed, is excellent. The solution is very clever, but at the same time, Carr stretches believability here and there with certain people’s incredible gullibility. Some editing was called for— it’s like X telling Y: “Hold on a second. I’ll go get a snack,” only to walk into the washroom. The murderer’s identity is excellently concealed until Carr drops such a whopper of a clue that it points at whodunit too clearly. His other clues are far more subtle, but their purpose is almost wasted when such an obvious pointer is given. Meanwhile, the romance in The Ghosts’ High Noon is far more successful than in Panic in Box C. This is because Jill Matthews, Jim Blake’s romantic interest, is a mysterious figure for much of the book, popping up at suspicious times, obviously attracted to Jim and yet unwilling to tell him about herself. The character isn’t particularly good, but she cloaks herself in an appealing shroud of mystery that makes the weak character forgivable. Far less forgivable is the historical colour, or rather, the lack of it. Carr was usually top-notch at this, but he didn’t bring to life the time period he himself lived through well at all. It consists of launching historical stuff in your general direction: look! Teddy Roosevelt is in the news! By the way, Gilbert of Gilbert and Sullivan died last year. Buy the new 1912 Cadillac, with an automatic starter (Lummy, ain’t she a dream, Bert? )… Drink Coca-Cola for 5 cents a bottle! And so on. It just isn’t very colourful, which is ironic, since Carr usually excelled in this aspect of his historical mysteries. Yikes. All that’s missing is sound effects. This dialogue, even for Carr, is horrific. The descriptive narrative of later day Carr can really be a chore to read, but you have to cut him some slack considering he was getting older and sicker. Still, I'm glad to read he still maintained a glimmer of his old genius and the impossible murder in the abandoned shed has me intrigued. I never read one of his books from that late-late period in his career. I'll dig up an unread JDC from my TBR pile in the near future! The impossible crime in the shed is worth the read. Carr should've edited a thing or two about his explanation to give a more plausible excuse here or there, but apart from that niggling, it's a pretty good job.